Movie: "My Big Fat Greek Wedding"
Toula Portokalos (Nia Vardalos) is a Greek woman working in her family's restaurant Dancing Zorba's. Lacking self confidence and constantly pressured by her family to marry a nice Greek boy, Toula decides to make a change. She overhauls her look, takes some computer classes at her local community college, and begins working at her aunt's travel agency. There, she meets Ian (John Corbett) and they quickly fall in love. Ian proposes to Toula, but there's one huge problem: he's not Greek. Now, Toula must get her family to accept Ian despite their hope that she would marry a fellow Greek. Written by and starring Nia Vardalos, "My Big Fat Greek Wedding" started out as a low budget rom-com and quickly became a smashing and massive box office success. Produced by Tom Hanks and Rita Wilson and costing a measly $5 million to make, it went on to gross over $368 million worldwide. This was more than likely a shock to everyone involved since this is an original story with no major stars who were already known to be box office draws. In the world of cinema, this very rarely if ever happens. 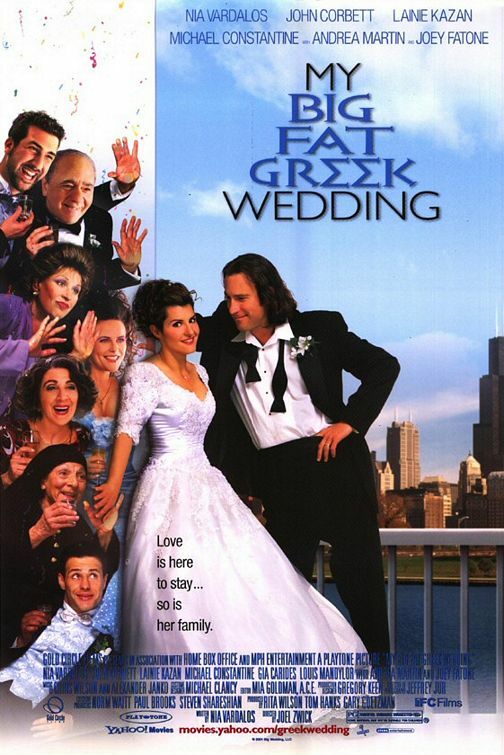 "My Big Fat Greek Wedding" was not an instant money maker, though. It didn't kill it out of the gate, but rather slowly gained momentum as good word of mouth spread about this charming little film. We can definitely see why. I remember fondly watching this movie in the theater with my mom, and afterwards, we walked a few doors down to have a nice Greek meal. This is the type of story that's good for everyone. Parents will love it, grandparents will connect with it, it's something women will love and men won't hate, and the younger generation can re-watch it and be able to fall in love with Toula and Ian all over again. This is an honest love story, not one filled with grand romantic gestures and too much needless drama, apart from some crazy family interventions. It is simply about two people from vastly different cultures meeting and falling in love and accepting each other wholeheartedly without reservation. The chemistry between Toula, played by Nia Vardalos herself, and Ian, played by John Corbett, is totally believable and we find ourselves rooting for their romance each time we watch. Sure, the "take off the glasses and you're beautiful!" plot line has been done before and is more than a little tired, but in this context, it actually works. There is a lot of awkward humor many in the general public might be able to relate to if they are from a family that embraces their culture, ethnicity, or region of birth. There are a lot of culture clash jokes about adapting to unfamiliar situations, and while some might see these as over-the-top and stereotypical, we've never really thought too much about it because some families we've met in real life are the same way, very dedicated to their ethnicity and heritage. This movie boasts a great supporting cast that makes up Toula's massive family, and each member get their chance to shine in their own way, even *NSYNC's Joey Fatone, who was really the only huge name at the time (though not for his acting). Despite all of the "haha, look at this culturally unfamiliar family!" tones and jokes, there is still a sincerity to "My Big Fat Greek Wedding" that's lacking in most modern romances. Each little nuance, each little look Ian gives Toula, the sacrifices they both make for one another, each part of their story is adorable and simultaneously crazy. From her dad's obsession with Windex to her grandma's breaking out of the house multiple nights in an attempt to run away, this film has a lot of heart and winds up being very endearing. The Portokalos family might be big, eccentric, and perhaps mildly insane, but it's all part of their charm. A fantastic romantic comedy! One year ago, we were watching: "In & Out"